An evening telephone call to the police alerted them to a lost couple that had set off walking from Upper Booth via Crowden Brook and then onto the Southern Edge of Kinder Scout. The couple told the police that they were ok and didn’t need immediate assistance but were currently unsure of their exact position. The couple said they would call again when they were safely off the hill but if there had been no contact after two hours, please call the rescue teams. 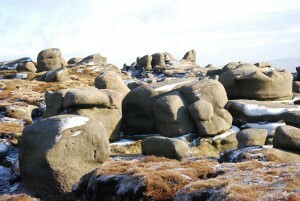 This information was passed to the Duty Incident Controller for the Peak District Mountain Rescue Organisation who, because of the severe freezing conditions, decided to play safe and act immediately. Buxton and Edale Mountain Rescue Teams were called out and started to prepare for a routine sear ch of Kinder Scout Southern Edge. Derbyshire police helicopter was also deployed over the area using its heat seeking equipment. At 18.45 hours the couple had made their own way to an outlying farm from where they were able to again speak to the police and confirm their safety. The rescue teams were stood down. Better safe than sorry! To see why the Controllers were concerned see news “It really is Winter”. Photo: Southern Edge Path through The Woolpacks, a complicated area even in daylight!